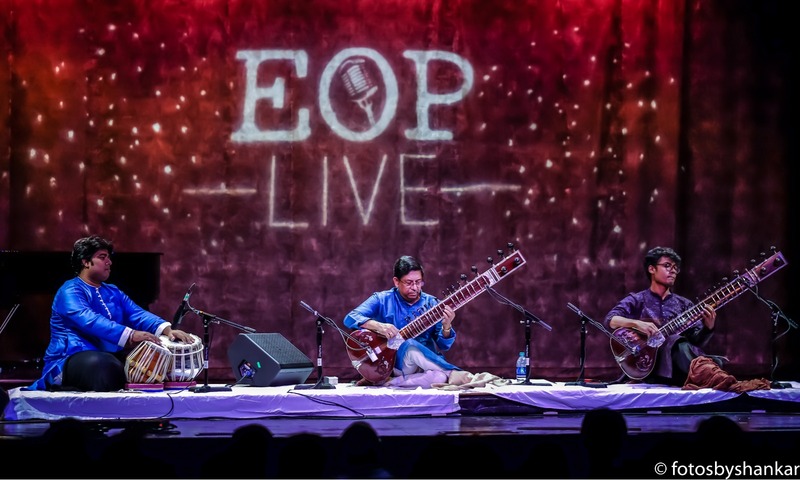 Atlanta, GA, November 9, 2018: Eddie Owen Presents (EOP)at Red Clay Music Foundry in historic Duluth reverberated with melodious strains from the masterful performance by sitar virtuosi Sugato Nag accompanied by Sandip Ghosh on the tabla and Snehesh Nag on the sitar on October 4, 2018. Eddie Owen kicked off the evening welcoming the audience and, upon his request, organizer Dr. Raktim Sen introduced the artists. Nag began with an evening Raga, Tilak Kamode. A soothing and reposeful Alaap was followed by a Drut in Teentaal. The Bandish, a composition of Nag’s Guru, the late Padmabhushan Pandit Buddhadev Dasgupta, ended with a high speed JHALA. With Durga Puja festival in the offing, the artists presented Raga Durga. A short and sweet Alaap was followed by a an upbeat Sitarkhani, a 16-beat cycle, composition and a popular Bandish, “Jai Jai Jai Durge Mata Bhavani” in Ektaal, a cycle of 12 beats. Artists tuned into Raga Bageshree, introducing the Raga with an emotive Alaap, followed by the very evergreen and euphonious Ektaal composition, “Apni Garaj Pakar Leenee“. The ending, a crystal clear, high-speed Ati-Drut Teental (Super-fast Teentaal) composition was a sheer joy to the listener. The concert ended with a soulful and stirring composition in Raga Bharavi that was a fitting finale to the grand musical evening in Atlanta, the first of its kind in the exquisite Red Clay Music Foundry. “Sugato is simply brilliant. This is his fourth concert inAtlantain the past 16 years and it is a sublime experience listening to him,” said Dr. Sen.
Nag’s skillful fingers racing the length of the sitar, spawning musical notes ranging from the subdued Alaaps to the pulsating Taans so effortlessly, and seamlessly, stand testament to his talent and love for music. One of the finest Sitar virtuosi amongst the present generation, and a worthy torchbearer of the famed Sarod Gharana of Seniah Shahjahanpur, Pandit Sugato Nag’s unique way of synthesizing two very different types of playing styles – the Gayaki style (that emulates the intricacies of a vocal singing)- perfected by Ustad Vilayet Khan and the brisk strokes of the Sarod style of the Seniah Shahjahanpur Gharana creates a unique and satisfying listening experience. Snehesh Nag, in his early twenties, displayed his skill, accompanied the maestro with gusto. A gifted musician, young Snehesh Nag, currently pursuing his master’s in music technology at Georgia Tech, blends a lot of “emotion, surprise elements, and aesthetic touches” on the sitar during his recitals. He was a Junior Scholar at ITC-SRA, a premium institution that adheres to the traditional way of learning from a Guru. Both, Snehesh and Sugato are pupils of the legendary Sarod artist, the late Pandit Buddhadev Dasgupta. Sandip Ghosh’s animated and energetic Tabla accompaniment added vigor, enhancing the experience. A well-known name in the music fraternity of India and abroad, Sandip Ghosh’s lightning fast and powerful finger movements on the Tabla coupled with great aesthetic sense of accompaniment have made him a very much sought-after percussionist. Sandeep is a disciple of Pandit Govinda Bose and now a pupil of the legendary Tabla Maestro Pandit Anindya Chatterjee. The stage lighting by Corey Giessen created the perfect ambiance for an Indian classical music concert. Shalom Aberle, the sound engineer ensured the mixing, the channel separation of the three instruments, the clarity of the instruments, the tonal quality and every aspect of music was pitch perfect. The music venue, nestled between enticing eateries and quaint little shops in historic Duluth, where the retro vibe meets contemporary provided the perfect platform for music lovers to engage and enjoy the ebb and flow of an entrancing performance.